There was a time, some of us remember and others need to know about, when AIDS wards in hospitals were waiting rooms for dying. Medics tried desperately to stop people slipping through but it was only ever a matter of time and there was nothing that could be done to save these people’s lives. When I look back, I see an aftermath of war, bodies lying everywhere. Lives blown apart by blindness, insanity, breathlessness, leglessness and disease. People racing time to patch up love, lives, families and the past. The beds all rested men. They’d walked in sick, gone to a four bed ward, gotten sicker, gone to a two bed ward and finally to a private room in time for a private death. The closed doors to those rooms eventually opened for what remained to come out and for the next to go in. You really felt it when someone new was admitted to the ward, what they yet didn’t, that they probably wouldn’t be going home, that they’d taken their place in the queue that had now moved one place along. Death was rarely spoken about and yet it was only ever a wall away. There was comfort in lovers, friends and family but some men had none. You’d leave alone a mother crying in the kitchen over making a cup of tea, time to gather herself to go back in. What could you say? There was little comfort in facing the truth but the truth was best left to be accepted. Amongst it all though, there was comraderie, jokes and talk of, “When I get out of here..”, anger and fear. Those men that I met are gone, bar one survivor. There’s a photo that I keep in a book. 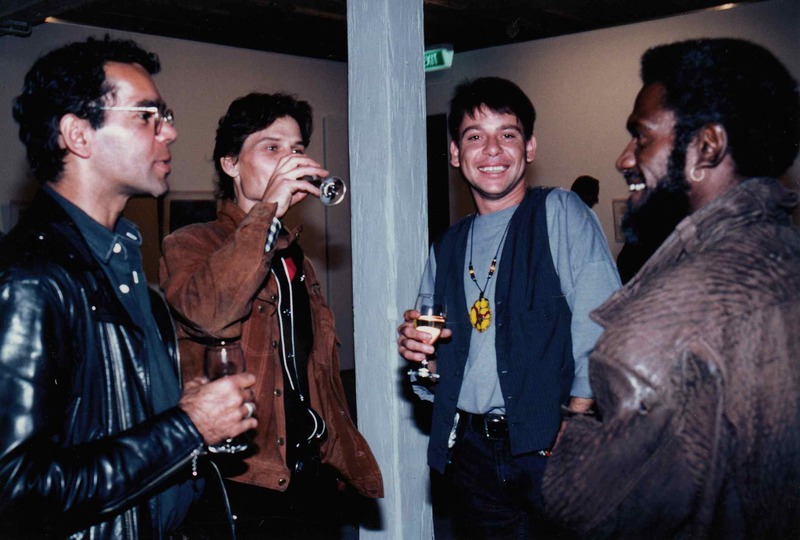 Me, him and two other fellas at a gallery opening, laughin’ up. Those three fellas are gone. Those three fellas were gay Aboriginal men. Why didn’t just one of them survive? Why wasn’t one of those deaths mine? We have to acknowledge these times, that people experienced this and that it was awful. We still need to talk AIDS and with those whose lives it hasn’t touched, I think they’d like to know. Historys have a habit of covering things up. This song (Poor Johnny Low Count) was written in that time when many of our friends were leaving us. “There’s a photo that I keep in a book,” photograph by Brenda Croft. M.Cook, T.Bishop, G.Darcy, M.Cole. Thanks for your comment Richard. Yes, the truth of it is the hardest to grapple but the best thing we can do is acknowledge the truth. Great comment Robert. Yeah you’re right, we should never think that this didn’t happen and we need to remind people that it did and that it’s not over. Thanks for reading. Wow, brillant article. And my beautiful Gary looks amazing. Nursed him till the end, and miss him always. Your beautiful Gary was a gorgeous guy. He spread happiness with his beautiful smile that this pic shows off so well. Happy you found this pic of him and thanks for your comments. Much appreciated. Seeing Gary’s smiling face again after all these years. Warms my heart immensely. He’s missed dearly. Thank you for sharing Corinne. Pleased for you his smile bought you a smile remembering him. Never forgotten. You’ve triggered many memories for me … That one hospital visit and the many questions those two little gals had … perhaps you should develop the story? People have needed the time to recover before remembering these times but in recovering, we musn’t forget, and need to make sure that any stigma is removed from the memories of these men’s lives. Thanks Janine for remembering.